For thousands of years, the Iberian Peninsula — home now to Spain and Portugal — has served as a crossroads. Phoenicians from the Near East built trading ports there 3,000 years ago, and Romans conquered the region around 200 BC. Muslim armies sailed from North Africa and took control of Iberia in the eighth century AD. Some three centuries later, they began losing territory to Christian states. Along with historical records and archaeological digs, researchers now have a new lens on Iberia’s past: DNA preserved in the region’s ancient skeletons. Archaeologists and geneticists are extracting genetic material spanning not just Iberia’s written history but its prehistory, too. “We wanted to bridge the ancient populations and the modern populations,” said Inigo Olalde, a geneticist at Harvard Medical School. Olalde is the lead author of a new paper published in Science that analyses the DNA of 271 ancient Iberians. In recent years, scientists have created similar chronologies for entire continents, based on hundreds of samples of ancient DNA. Now researchers are starting to narrow their focus to smaller regions. With a total of 419 ancient human genomes obtained by various laboratories, Iberia offers a rich trove. Scientists have recovered only 174 ancient genomes in Britain and just eight in Japan. This dense record shows that Iberia’s genetic profile changed markedly in response to major events in history, such as the Roman conquest. But researchers have also uncovered evidence of migrations that were previously unknown. Iberia, it now seems, was a crossroads long before recorded history, as far back as the last ice age. The oldest known human DNA in Iberia comes from a 19,000-year-old skeleton found in 2010 in a cave called El Miron, in northern Spain. The skeleton belonged to a woman, a member of a band of Ice Age hunter-gatherers. People in Iberia continued to live as hunter-gatherers for thousands of years after that, long after the end of the Ice Age. Olalde and his colleagues analysed DNA from four additional hunter-gatherers, while a separate team, based at the Max Planck Institute for the Science of Human History, extracted DNA from 10 more. Both teams obtained the same striking result: Iberian hunter-gatherers had a remarkable mix of genes, showing that they descended from two profoundly distinct groups of early European hunter-gatherers. One of these groups can be traced as far back as 35,000 years, thanks to a skeleton discovered at a site in Belgium called Goyet. The Goyet-related people spread across Europe, only to be replaced on much of the continent near the end of the Ice Age by a genetically distinct population. The earliest sign of the second group appears 14,000 years ago, known to researchers by DNA in a skeleton at an Italian site called Villabruna. But in Iberia, the new studies find, the Goyet and Villabruna people coexisted. Hunter-gatherers across the peninsula had a mixture of ancestry from the two peoples. “This is quite amazing, because it’s not happening in other areas,” said Vanessa Villalba-Mouco, lead author of the Max Planck study, published in Current Biology. Villalba-Mouco speculated that the geography of Iberia — located in a far corner of Europe — may have allowed the Goyet people to endure there after they disappeared elsewhere. “Maybe nobody was bothering these hunter-gatherers,” she said. But whatever solitude Iberia might have offered came to an end about 7,500 years ago, when new people arrived with crops and livestock. These first farmers, originally from Anatolia, brought with them a distinctive genetic signature. After their arrival, the genetic makeup of Iberians changed drastically. Ninety per cent of the DNA from the later skeletons derives from the Anatolian farmers; 10 per cent comes from the hunter-gatherers. But this shift was not a simple story of an older population replaced by a newer one. Starting about 6,000 years ago, Olalde and his colleagues found, hunter-gatherer ancestry in Iberian farmers actually increased to 20 per cent. It’s possible that hunter-gatherers endured beyond the advent of farming. They may have taken up farming as well, and perhaps later the two cultures merged. For centuries afterward, the researchers found, there was little change in the genetic profile of Iberians. But there are hints of a few remarkable migrations. A skeleton from an elaborate grave in central Spain about 4,400 years old belonged to a man whose ancestry was 100 per cent North African. Another striking result emerged when the researchers studied the DNA from a 3,500-year-old woman. They concluded she had a North African grandparent. These findings suggest that people were moving into Iberia from Africa more than 3,000 years before the rise of the Roman Empire. “These are cosmopolitan places,”Reich said. About 4,500 years ago, still another wave of people arrived, profoundly altering the makeup of Iberia. A few centuries earlier, nomads from the steppes of what is now Russia turned up in Eastern Europe with horses and wagons. They spread across the continent, giving up nomadic life and intermarrying with European farmers. When they finally reached Iberia, these people spread out far and wide. “They really have an impact on the whole peninsula,” Olalde said. But skeletal DNA from that period is striking and puzzling. Overall, Bronze Age Iberians traced 40 per cent of their ancestry to the newcomers. DNA from the men, however, all traced back to the steppes. The Y chromosomes from the male farmers disappeared from the gene pool. To archaeologists, the shift is a puzzle. “I cannot say what it is,” said Roberto Risch, an archaeologist at the Autonomous University of Barcelona, who was not involved in the new studies. But he ruled out wars or massacres as the cause. “It’s not a particularly violent time,” he said. Instead, Risch suspects “a political process” is the explanation. In their archaeological digs, Risch and his colleagues have found that Iberian farmers originally lived in egalitarian societies, storing their wealth together and burying their dead in group graves. But over several centuries, palaces and fortresses began to rise, and power became concentrated in the hands of a few. Risch speculated that the cultural shift had something to do with the genetic shift found by Olalde and his colleagues. The Bronze Age in Iberia was followed by the Iron Age about 2,800 years ago. In skeletons from this period, Olalde and his colleagues found clues of more arrivals. Iron Age Iberians could trace some of their ancestry to new waves of people arriving from northern and Central Europe, possibly marking the rise of so-called Celtiberian culture on the peninsula. 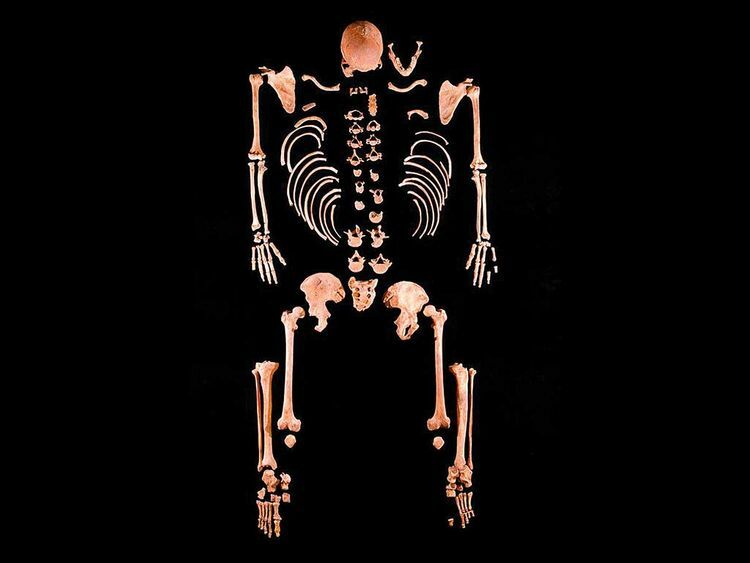 In addition, the scientists found a growing amount of North African ancestry in skeletons from the Iron Age. That may reflect trade around the Mediterranean, which brought North Africans to Iberian towns, where they settled down. North African ancestry increased in Iberia even more after Romans took control. Now the peninsula was part of an empire that thrived on widespread trade. At the same time, people from southern Europe and the Near East also began leaving an imprint. This shift in ancestry could explain one of the biggest mysteries in Iberian history. Researchers have long puzzled over the distinctive culture of the Basque region in northern Spain. The Basque speak a language that is unrelated to other European tongues. Some researchers have speculated that they descended from a population that had been distinct since the Bronze Age or earlier. Genetically, at least, that doesn’t seem to be the case. Before the Roman era, the Basque had DNA that was indistinguishable from that of other Iron Age Iberians. But Roman genes did not flow into Basque Country. After the fall of Rome, ancient DNA in Iberia reflects its medieval history. Skeletons from the Muslim era show growing ancestry from both North Africa and sub-Saharan Africa. Which brings us, just a millennium later, to the present. In February, Clare Bycroft of the Wellcome Trust Center for Human Genetics at the University of Oxford and her colleagues published a study of the DNA of 1,413 people in Spain. The team was able to identify pieces of North African DNA in people across Spain. The researchers estimated that the subjects’ North African ancestors lived about 800 years ago, during Muslim rule. At the height of the Muslim rule, a few small Christian states survived on the northern coast of Spain. As Muslims lost power, those states expanded their southern borders, starting roughly 900 years ago. Up until now, wide swathes of time typically separated genetic studies of living people and those of ancient DNA. But now, in places like Iberia, the gaps are being filled in, creating an unbroken genetic chronology. “The two worlds are starting to merge,” Bycroft said.